Whether it's delicious or not, single-cup coffee is expensive. In fact, pound-for-pound, it costs consumers far more than the finest artisanal coffee available in the Bay Area. A 24-pack of Folgers Gourmet Selections K-Cup, for example, typically retails for $16.49. The capsules each hold roughly 8 grams of coffee, which means that the 24-pack works out to about $39 a pound. A 24-pack of Starbucks House Blend typically costs $22.49, or about $53 a pound. By contrast, the same Starbucks roast costs just $12 a pound when sold in a single bag. An artisanal bean, like Four Barrel Coffee's Kenya Gatomboya, a shade-grown coffee from a 700-member cooperative, costs $18 for a 12-ounce bag, or about $24 a pound. But as expensive as single-cup coffee is for consumers, the costs to the environment are even higher. As consumers replace bags of ground coffee in their pantries with boxes of disposable pods, the amount of packaging waste associated with coffee-making has swelled exponentially. "We can get to a cup of coffee dozens of different ways," said Martin Bourque, director of the Ecology Center in Berkeley. "The best way is a large volume of coffee that goes into a cup that's washed and re-used a thousand times, and the coffee goes to compost or mushroom production. That's best-case scenario," he said. "The worst-case scenario is these pods." Some single-serve coffee systems use plastic pouches, while others use aluminum pods, but most, including the popular Keurig K-Cup system, rely on plastic capsules. 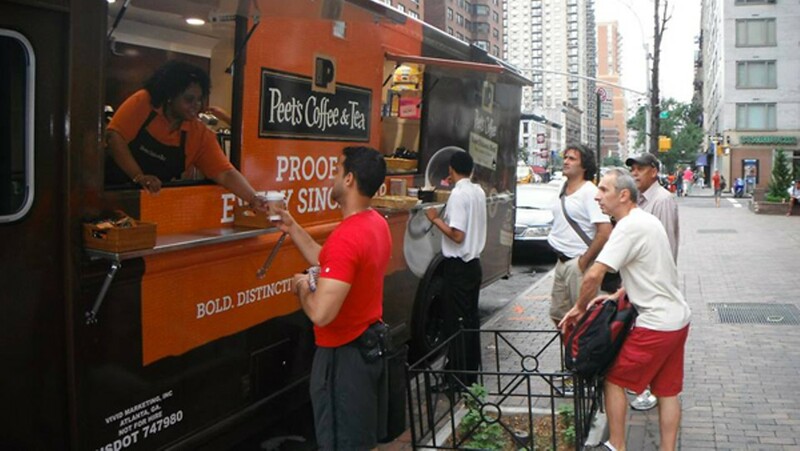 This is the kind Peet's opted for. They're miniature, disposable drip brewers: A plastic mesh filter basket filled with coffee grounds enclosed in a plastic cup and sealed with a plastic-and-foil lid. The single-cup machines then pierce the lid and the bottom of the capsule and flush hot water through to produce a cup of coffee. "The challenge presented by these single-cup pods is the fact that you have a multi-material item," explained Tom Padilla, recycling coordinator for StopWaste.org, the agency tasked with creating a sound waste management and recycling program for Alameda County. Even if the capsule components were individually recyclable, he said, they're impossible to process because they're fused together. "They were designed to be trash from the outset," said Rebecca Jewell, recycling program manager for Waste Management's San Leandro facility. Hopeful consumers continually toss them in the recycling bin, she said, but they end up in a landfill anyway. Coffee companies are well aware of the problem. The second brewing system Keurig introduced, the Vue system, tried to address the issue of recyclability in what the company called "an incremental step on our environmental journey." The system doesn't work with the original K-Cup packs, which are made from number seven plastic, a blended plastic that's nearly impossible to recycle. Instead, the Vue capsules use a plastic cup made from polypropylene, number five plastic, and users can peel the foil lid and filter away from the cup. The cups are then recyclable — in theory. The problem is the cups are too small to be captured in most recycling facilities where machinery separates objects by size and density, said Mark Oldfield, assistant director of public affairs for California's Department of Resources Recycling and Recovery. Most facilities filter out items under two-inches in diameter. In any case, number five plastic is rarely recycled in California, Oldfield said. "It's very difficult to deal with something like that," he added. "It's something where convenience is trumping our typical mantra of reducing and recycling." At the Davis Street Transfer Station, where Jewell works, half of Oakland's trash and recycling is processed. 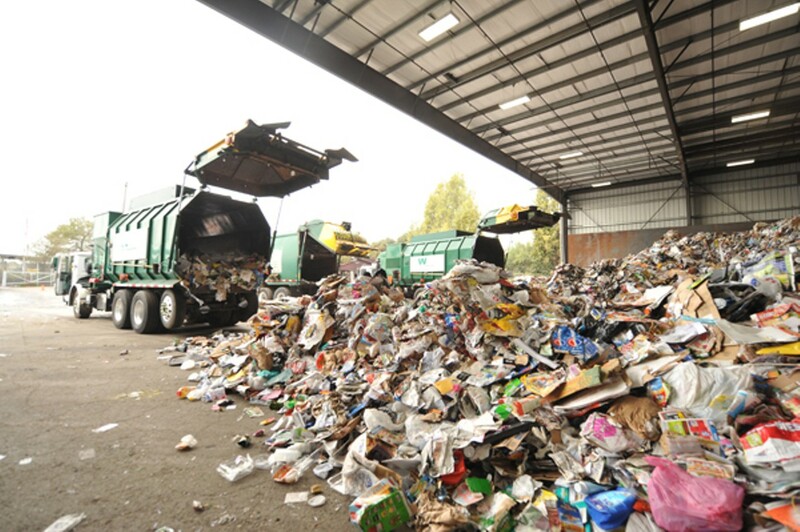 Some 750,000 tons of garbage move through the facility every year. The trucks that empty our trash cans dump their loads here, into a pit, nine-feet deep with trash, where a dozer churns it up before semi-trucks take it to the Altamont Landfill. Our recyclables end up at Davis Street, too. They enter the sorting facility through a chute, dropping onto a vibrating sifter — a metal platform punched full of holes — and as they bounce across it, the small items fall through. Everything else jostles along into a sorting system of chutes, magnets, and blowers that empties onto conveyor belts, where workers clad in goggles, dust masks, and needle-proof gloves winnow out valuable materials. Outside the city-block-size building that houses the sorting apparatus, the small objects sifted out of the recycling form a mini mountain range. The coffee pods from our recycling bins land here, amid bottle caps, pill bottles, marbles, plastic dolls, and the spent limes from countless Coronas. "We are always trying to capture the little objects in the hope of finding glass," Jewell said. Mixed in with all the junk here are shards — valuable because California's wine industry keeps the market for recycled glass strong, Jewell explained. The small pieces of debris, including the single-cup pods, get shipped to a glass-recycling facility, where they're separated from the glass using magnets and float baths and then sent to a landfill. 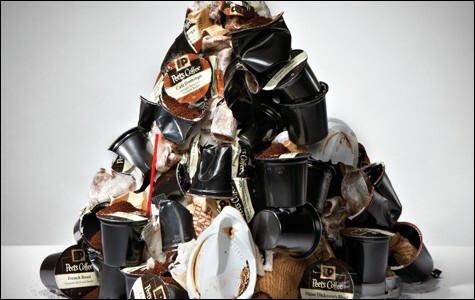 So while coffee companies tout the energy-efficiency of single-cup brewers and trumpet their solution to wasted coffee, their organic and fair trade pods pile up in landfills by the billions. "Even though they're little, they add up," noted Darby Hoover, a senior resource specialist with the Natural Resources Defense Council. There's a dearth of data available on the amount of waste generated by single-serve brewing systems, but a little back-of-the-envelope arithmetic offers a crude — and eye-popping — estimate: The US Census Bureau puts the total US population at around 316 million, so if one-third of us are using single-cup brewers at home or at work, that's more than 100 million single-serve coffee packages a day or 36.5 billion a year. (Keep in mind, that may be a conservative estimate because it assumes that each person only makes one cup of single brew a day.) 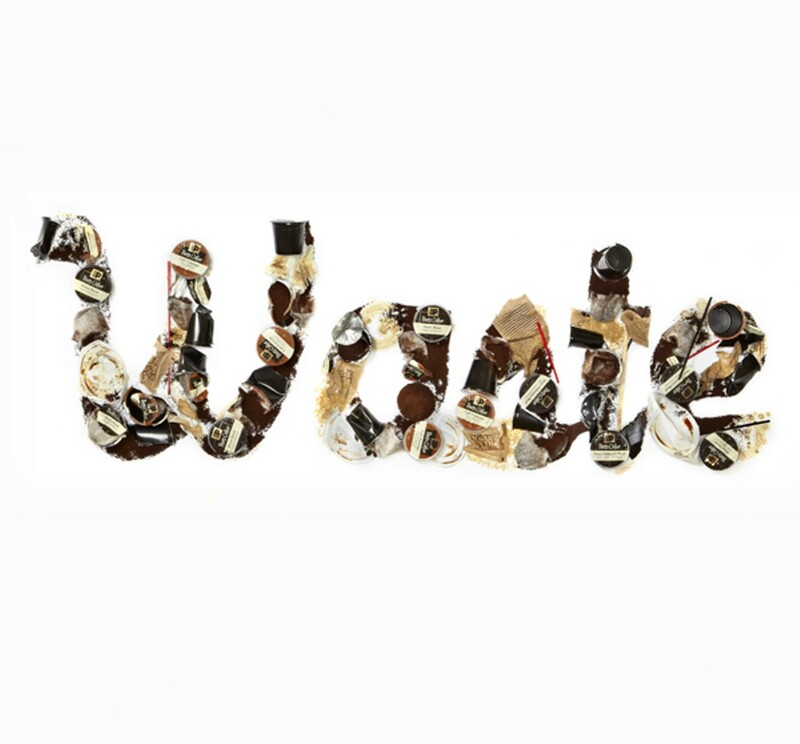 If the capsules weigh roughly 12 grams (like Peet's pods), that's 438 billion grams of single-cup coffee packaging used annually, or about 966 million pounds of waste. That's the equivalent of throwing away about 150,000 Hummer H2s each year. 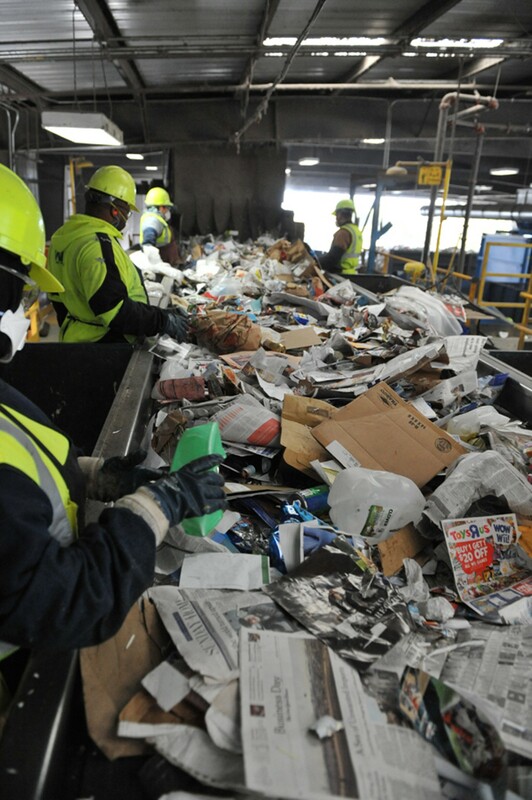 "We're filling up our landfills with materials we should be using more wisely," Hoover said. "It's a trend of dissociating more and more from the consequences of using a product. Landfills represent our misconception of 'away.' What we mean is that they disappear from our daily lives and we don't have to think about them any more. Away is not something that is going to work long-term. Eventually we're going to fill up that pit in the ground and then another one and then another one." Environmentalists also voice concerns about the impact of landfills through groundwater contamination and air pollution, as methane, a powerful greenhouse gas, is released from decomposing material. Single-cup pods waste resources, too: When non-renewable source materials end up in landfills, those materials are lost forever. The building blocks of plastics are derived from petroleum, and our main source of aluminum is bauxite ore — with a finite supply of these resources, environmentalists point out, it makes little sense to allocate them to products that will be used once and then end up in a sealed pit. The essential problem with single-cup pods, Hoover continued, is that they're an unsustainable way of delivering coffee to people. But they're awfully good for business. Environmentalists who've been watching the industry say the thrust toward small, intricately packaged products like coffee capsules is a boon for companies in many ways. "They're emblematic of the way that packaging is headed in general," said Bourque. He explained that plastic packaging proliferated with the rise of global distribution in the Eighties, and as the cost of transporting products went up and their ability to abide travel became more important, plastics quickly replaced heavier, breakable glass containers. Now, new plastic technologies allow companies to use packaging to their advantage in other ways. Blister packs — "the ones you always worry about hurting yourself with," as Bourque describes them — have great marketing value. "There's a lot of real estate for you to put your brand on," he said. Plus, they make it possible for little products to hang prominently in stores instead of sitting on the shelf tucked in among dozens of competitors. Single-serve coffee also provides companies more surfaces to paint their brand logo on, but environmentalists say it's exemplary of a more troubling tendency. "There's a trend where producers of globalized products are looking for ways to package and sell very small amounts of product because they make a lot more money than selling in bulk," noted Christie Keith, international co-coordinator for GAIA, the Global Alliance for Incinerator Alternatives. This trend taps two sets of consumers: those with the luxury to pay for convenience, and those with means so limited they can only afford the smaller portions. "The core of this question," Keith continued, "is when you're producing a lot of waste for a small quantity of product, who's suffering the consequences?" Keith and her colleagues think we all are. They argue that at every stage of the process — from the public health costs of plastic resin manufacturing in Louisiana's "Cancer Alley" to the effects of long-distance product transport on air quality, to the cost of waste management services — we all pay the price. But is it worse for those of us who are already paying $50 a pound for coffee, or those of us who aren't? The health effects of drinking something that's made by forcing scalding water through a flimsy plastic cup are unclear. A spokesperson for Keurig said the company uses only BPA-free plastics that have been approved by the FDA. One Keurig patent lists the K-Cup components as a blend of polyethylene, ethylene vinyl alcohol (EVOH), and polystyrene. These are all commonly used plastics, but there are known health issues associated with styrene. Styrene has been shown to migrate from containers into food or drinks and accumulate in our fatty tissue. Long-term exposure to small amounts of styrene has been linked to neurotoxic symptoms like fatigue, nervousness, and difficulty sleeping, plus low platelet counts and chromosomal and lymphatic abnormalities. But Keith said that the way things work now, there's no incentive for corporations to take responsibility for the sustainability of their products. She supports extended producer responsibility laws, which hold corporations accountable for the costs of managing their products at the end of their life cycle, as one avenue for change. But large companies have historically opposed such laws, arguing that they'll be forced to raise product prices to defray the expense. Hoover, however, noted that those costs aren't being created: Consumers will just see them at the store instead of on their garbage and recycling bills. And forcing producers to face those costs, she added, could make for saner packaging practices.